Dr.N.G.P initiated the establishment of Dr. N.G.P. College of Education in 2005, and the N.G.P. Group of educational institutions. 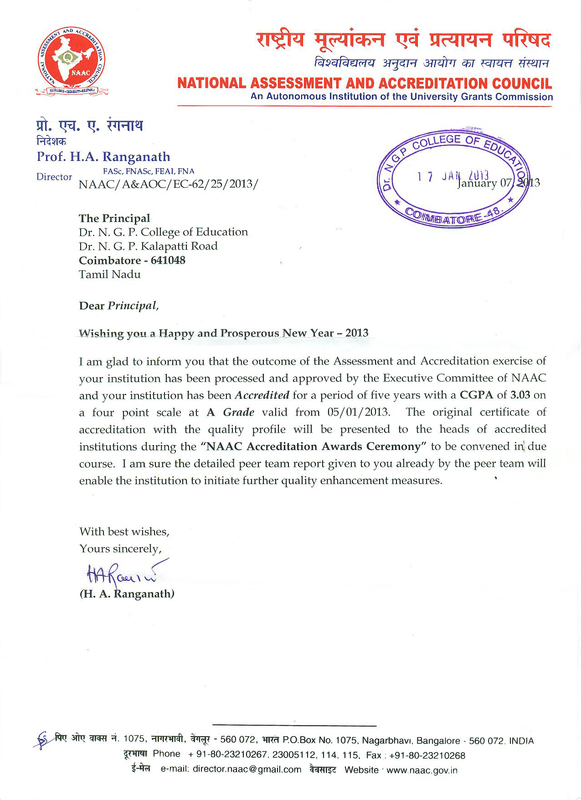 The College has been approved by NCTE, New Delhi and affiliated to Tamilnadu Teachers Education University, Chennai. Teacher education is no longer traditional and stereotyped. It cannot afford to remain conservative and static. It has moved from the 'gurukul' to an electronic age orientation. Chiselled professionalism and unshakable commitment of teacher educators work in perfect consonance and our vision, zeal, imagination and creativity are continuously supported by fresh academic enrichment and research based pedagogic innovations.